War often creates a desperate situation in which second-rate options are pressed into service. In the world of AFV’s, these may be old designs which resurface when war is on the doorstep. One such example is the Trubia-Naval produced and deployed by the Republican Army of the North during the Spanish Civil War. After the failed General’s coup of July 17th-18th 1936, Spain descended into civil war. The main fighting force of the rebellious Generals (the Nationalist) was in the Spanish colonies of North Africa and was airlifted to peninsular Spain by the German and Italian air forces. Once they gathered with other rebellious forces in Andalucía, they advanced north towards the Republic’s capital, Madrid. In the central north Spanish plateau, the rebels triumphed with a force made up of Carlist and Falangist militiamen. This meant that the industrial heartlands of the Basque Country and Asturias was cut-off from the main Republican territory. On October 6th 1936, the Republican Courts (Parliament/Congress) enacted provisions for a statue of autonomy giving the Basque region quasi-de facto independence. The Partido Nacionalista Vasco (PNV) [Basque Nationalist Party] leader, José Antonio Aguirre, would became ‘Lendakari’ [President] and also took on the Ministry of Defense portfolio. Given their isolation, the autonomous Basque state created its own army and navy. In the state of war, the Basque military authorities considered building tanks and artillery tractors for their armed forces. 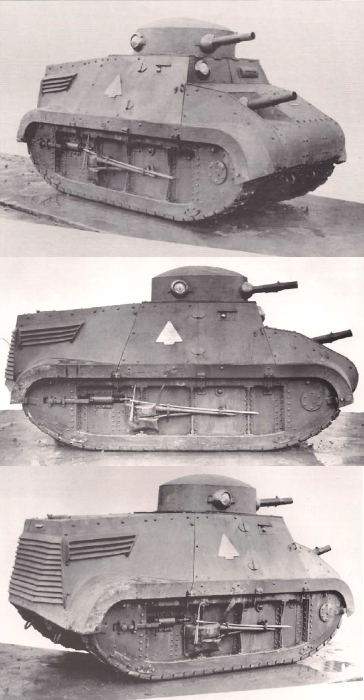 The first project to create an indigenous Spanish tank design dated from 1935. 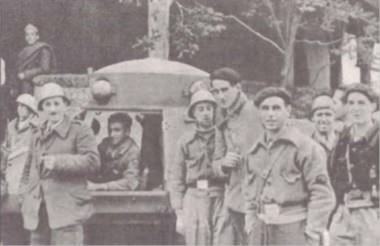 Commander Victor Landesa Domenech, an artillery officer attached to the Trubia arms factory in Asturias (Northern Spain), Rogelio Areces, the Trubia arms factory’s Chief Engineer, and Captain Carlos Ruíz de Toledo, a Commander in charge of Batería de Carros de Asalto de Artillería [Artillery Tank Battery] in its first engagements during the Rif War, teamed up to design a tank for the Spanish Army on their own initiative and financed out of their own pockets. 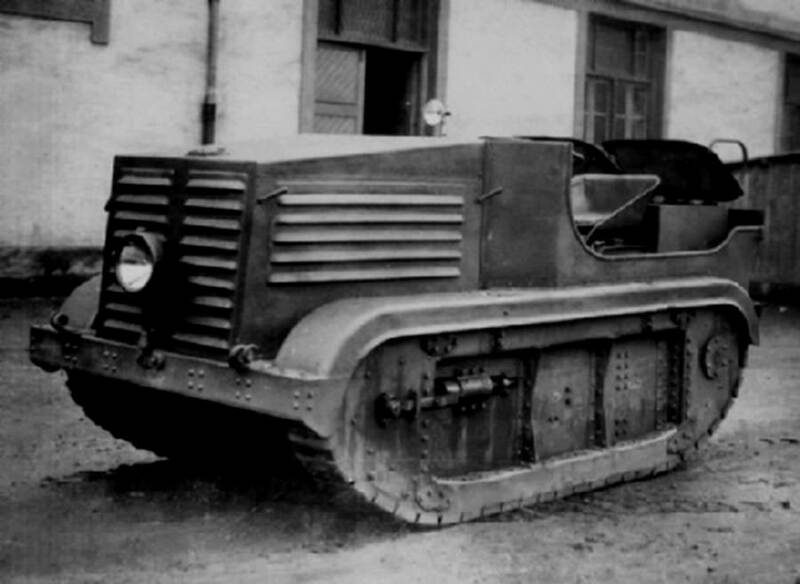 The prototype and the serial production version, the Trubia Serie A, would closely resemble the Renault FT, what was considered to be the superior tank in Spain at the time. However, there were some differences. They had improved firepower in an innovative system involving two overlapping turrets with independent movement, each armed with a Hotchkiss M1914 7mm machine gun, a larger size, an additional crew-member (loader) and marginally thicker armor and engine power. It also included an innovative ‘Orion’ suspension system, which was supposed to improve upon traditional systems, in addition to enhancing turning capabilities and minimizing the effects of the tracks on roads. In this integrated track design, the links were suspended from the chassis and held together by a lateral metal wall. This system was designed to prevent the tracks from coming off when maneuvering. 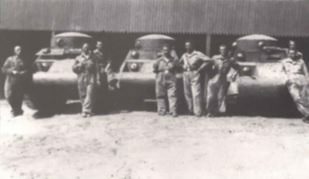 Four of these vehicles and a prototype were built with the former seeing service up to the Spanish Civil War. Landesa Domenech and Areces continued to work together designing a tractor for military use known as the Tractor Landesa [Landesa tractor]. Following a series of trials, 9 would be bought by the Army. They also designed an armored and armed upgrade. Both versions saw service in the Spanish Civil War. 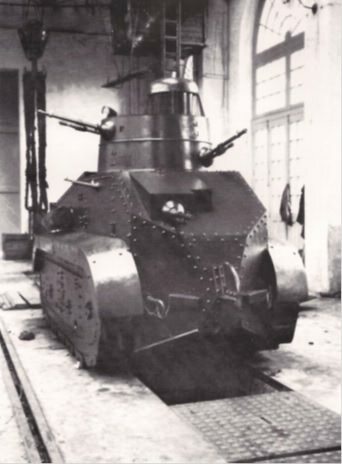 Subsequent to their tractor success, Landesa Domenech and Areces designed a new light tank concept intending it to be used by the Spanish Army. The Carro de Combate Ligero Para Infantería Modelo 1936 as it was known would only be a paper project but it would serve as inspiration for the Trubia-Naval. The main features of this paper tank were: a small size; 2 crewmen; a 80hp engine; and a mix of composite and conventional armor. The sides and front of the vehicle were the composite element of the armor, with the outer layer being 13mm thick and the inner layer a mere 3mm thick. The space between plates was 25mm thick and was most likely filled by wood. The rear, top and bottom of the tank were 3mm thick; a 40mm main gun; and, an improved and smaller version of the suspension used on the Trubia Serie A. Original blueprints from the Trubia arms factory of the side, top, and front of the Carro de Combate Ligero Para Infantería Modelo 1936 as drawn by Victor Landesa Domenech and Rogelio Areces in which the tank’s key features can be distinguished. Note the striking resemblance to the Trubia-Naval. The situation in the north of Spain for the Republic in the Summer of 1936 was dire. The Nationalist troops of General Mola (mostly militiamen) were reinforced with troops from General Franco’s Army of Africa and planned to cut the northern regions loyal to the Republic off from the French border, through which tanks and planes were being delivered. At the same time, Republican forces tried repeatedly to take Oviedo (Asturias), which, with its history of revolutionary activities, had surprisingly supported the coup, whilst simultaneously fending off Nationalist troops attacking from the west. Given this situation, in August 1936, Captain Ignacio Cuartero Larrea was sent to Bilbao (Basque Country) from the Trubia arms factory to discuss the possibility of the production of war materiel for the Asturias Front. 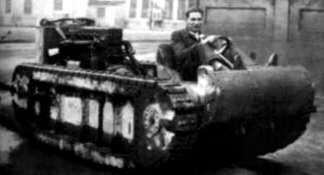 Cuartero Larrea was experienced in tank design as he had participated in the construction of the Trubia Serie A. The Basque authorities convinced Cuartero Larrea to stay in Bilbao (which by October was the seat of government of the Autonomous Basque State) to direct the construction of war materiel, and offered him the installations of Sociedad Española de Construcciones Navales (SECN) [Spanish Society of Naval Constructions] to carry out his task. Although SECN primarily focused on naval industry, it had, in the years leading up to the Civil War, been building SOMUA lorries and buses under license in its Sestao factory. More importantly, SECN also built the Bilbao Modelo 1932 armored cars, the most advanced pre-Civil War Spanish AFV design. Cuartero Larrea returned to Trubia arms factory with José Rufo Galárraga, the Chief Engineer at SECN, to study the vehicles and documents available there. After some deliberation, they chose the blueprints of the Carro de Combate Ligero Para Infantería Modelo 1936 to take back to Bilbao. The Trubia Naval would be almost a direct copy of the blueprints from Trubia. The rearmost part of the vehicle had the engine ventilation consisting of a twelve-lat vertical grille, with an additional four lat grille mounted horizontally on each side (unlike the blueprints, which had twelve lats). Those on the side were at a slight inwards angle. The side hull, which was angled at 65º, had two large hatches on each side for crew access with a small loophole in the upper center. 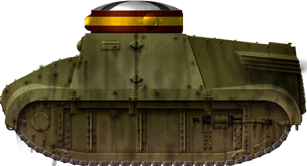 The large size in comparison to the rest of the tank would have most certainly affected armor effectiveness. The side went down and joined the mudguards which covered the entirety of the top tracks. The turret was placed atop the hull and consisted of a circular structure with a shallow dome covering it welded to it at the top. To the front was the main armament and on each side there appears to be oval-shaped stroboscopes with horizontal turn allowing for continual vision. The uppermost frontal plate consisted of two hinged plates opening outwards. The right plate had a headlamp, whilst the left one had a vision slit for the driver. From this plate, the armor extended almost horizontally and then almost vertically creating a slightly angled plate which had a machine gun. Below this, the armor took a rounded shape. The composite armor of the blueprints was replaced by more traditional and simpler riveted chromium-nickel steel plates which were between 8mm and 16mm thick, though exact details are not known. The 40mm armament from the blueprints was dropped due to unavailability of guns and was replaced with a machine gun. The first model of the Trubia-Naval was equipped with two Lewis 7.7mm machine guns which had a cooling jacket, giving the appearence they were a larger caliber gun. There was a large supply of Lewis guns and ammunition as a Soviet ship carrying 200 of these machine guns had docked in Bilbao port on October 1st 1936. The rest of the series would be equipped with two Degtyaryova Tankovy (DT) 7.62mm machine guns. 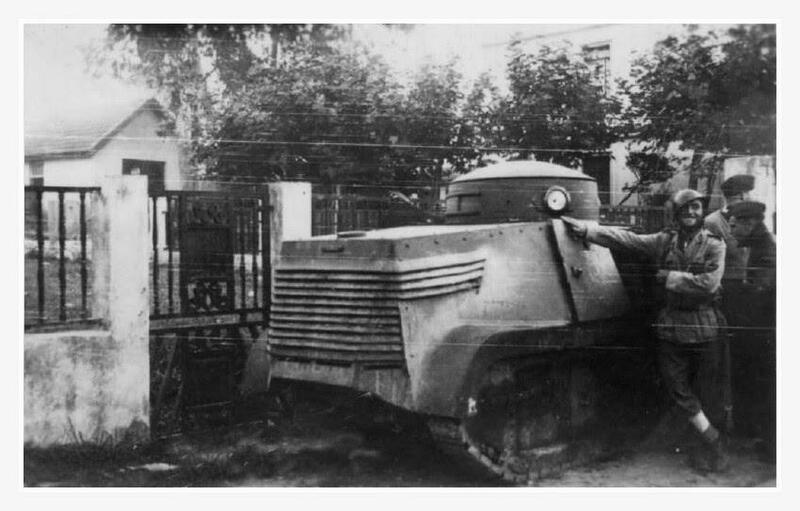 The DT was already carried by the Soviet-supplied BA-6’s and FAI armored cars. This gas-operated machine gun was simple, robust, and ideal for compact spaces, though it had a complex feeding system. The secondary frontal machine gun had limited use due to its position and having to be operated by the driver. The tank carried 9,600 rounds in total. Series of photos of the first Trubia-Naval built by Sociedad Española de Construcciónes Navales in Sestao. The attention to detail in its construction and features and it being equipped with two Lewis 7.7 machine guns covered with a protector to give the appearance it was armed with a cannon all point to its being the first-built Trubia-Naval. Note the triangle denoting the manufacturer on the side. Photo: Artemio Mortera Pérez (2007), p. 65-66. Although it had proved to be outdated and ineffective, the ‘Orion’ suspension system was used due to the urgency of the situation. Each track consisted of a long ellipse-shaped structure formed by two parallel steel sheets and was covered by a mudguard. Between the two sheets, there was a track for the track rollers to travel through. Between the steel sheets, there were drum brakes slightly modified from previous designs. Unlike in most other vehicles, the track rollers were integrated into the tracks and moved in unison with the track links along the tracks set between the two sheets. This was an updated copy of the one on the Trubia Serie A and Landesa tractor, albeit, smaller. In the rear of the tank was the engine compartment. 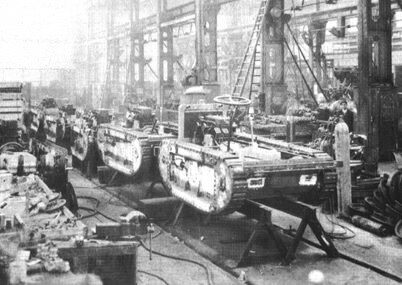 Most tanks were equipped with 6 cylinder MAN engines with between 60hp and 100hp, which were plentiful in the Sestao factory where the Trubia-Navals were being produced. These engines had their limitations because of their low elasticity and high revolutions per minute, which meant that with any minor brake, power was lost. It is also stated that two Trubia-Naval were equipped with 6 cylinder Chicago engines and one had a 4 cylinder Chicago engine. The gearbox, which was situated beneath the driver’s seat at the front, had three forward gears (40km/h, 30km/h, and 10km/h) and one reverse (10km/h). The vehicle was driven with a steering wheel which activated the brakes and clutch. However, according to Galárraga, some of the tanks were operated by means of two direction levers. The driving and combat compartment at the front of the tank housed the driver, who sat at the front, and the gunner/loader, who was positioned behind him. Given the small size of the tank, the gunner/loader would have had to sit or crouch when inside the tank. The driver also operated the frontal machine gun. Which one of the two was the commander was unspecified. A Trubia-Naval being tested with the driver’s head emerging out of one of the enormous side doors. Photo: Artemio Mortera Pérez (2007), p. 67. Photo of three unarmed Trubia-Naval being tested in the area surrounding the SECN factory. Photo: Artemio Mortera Pérez (2007), p. 67. One of the most controversial issues surrounding the Trubia-Naval is its name. The factory committee which had built them insisted the tank be named Tanque Constructora Naval [Naval Constructora Tank] in homage to the company building it, but Cuartero Larrea gave the name Areces-Trubia instead – Areces in honor of Rogelio Areces, one of the tank’s designers (Landesa Domenech had defected to the Nationalist, so his name was not an option), and Trubia after the arms factory from where the vehicle’s blueprints originated (conveniently, Cuartero Larrea worked at said factory). The disagreement even reached Lendakari Aguirre, and it was decided that the Chief Engineer at the Trubia factory, Constantino Alzueta Estrada (who had been involved in the Trubia projects since 1925), should check the blueprints and assess the resemblance. Seeing the obvious similarities, a compromise was met, and the official name given was Trubia construido en la Constructora Naval [Trubia built at the Constructora Naval], with ‘Trubia-Naval’ being used for short. However, most tanks only had the Naval crest and shield on them. Again, despite all this, most official documents referred to them simply as Trubia. 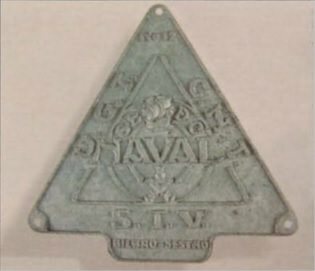 The shield on Trubia-Naval no.12 which was captured by Nationalists in April 1936. Despite the fact that an agreement had been reached to acknowledge the involvement of both the Trubia arms factory and SECN in the design and construction of the vehicle, only SECN is represented. Note on the sides of the triangle the initials of Unión General de Trabajadores (U.G.T. ), Confederación Nacional del Trabajo (C.N.T. ), and Solidaridad de los Trabajadores Vascos (S.T.V. ), all of which were trade unions. Photo: Artemio Mortera Pérez (2007), p. 88. Some sources (such as F.C. Albert, Carros de Combate y Vehículos Blindados de la Guerra 1936-1939 (Barcelona: Borras Ediciones, 1980)) name the vehicle Carro Euskadi [Basque Tank], but this name was never used during the Civil War and is incorrect. A nickname often associated with the Trubia-Naval is ‘tanque de juguete’ [toy tank] due to its small size. To add to the confusion, when Trubia-Naval tanks were captured by Nationalist forces, their official documents sometimes referred to them as Carros Rusos [Russian [sic] Tanks]. 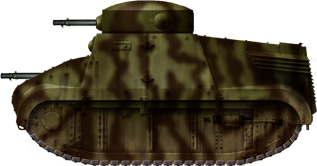 Another point of interest is that Republican and Basque documents made a distinction between two models of the tank, Modelo 1936 and Modelo 1937. Artemio Mortera Pérez (one of the higher regarded authors on AFV usage in the Spanish Civil War and author of a book dedicated to the Trubia family), theorizes that there is a simple explanation to this. 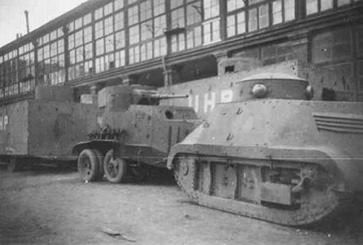 The Modelo 1936 are the first ones built in Sestao, whilst the Modelo 1937 were a never completed improved version adapted following a series of complaints from Captain Luis Basterretxea de Arendia (Commander of the Trubia-Naval company of the Euskadi Light Tank Battalion in March 1937) and his men. A last clarification to make is that the Trubia Serie A was not a prototype to this tank. That is not to say that the two are unrelated. As already explained, the Trubia-Naval was based on and mostly developed from the Carro de Combate Ligero Para Infantería Modelo 1936 designed by Victor Domenech and Areces. This vehicle was influenced by another of the duo’s designs, the Landesa tractor. Landesa Domenech and Areces had also collaborated together to develop the Trubia Serie A. All these vehicles (the Trubia-Naval only partly) were designed with the intention that it be the new light tank for the Spanish Army. A common design feature was the ‘Orion’ suspension system which continued to be used from 1926 to 1937. A camouflaged Trubia Naval of the Republican forces in the Basque country, 1937. An unarmed Trubia Naval in hypothetical Nationalist colors. Most captured tanks had the red and yellow Spanish flag painted around the turret. In some cases a St. Andrew cross was painted on the top of the turret for air recognition. The machine guns on this model have been removed and it would have mostly been used for towing, as its combat value was minimal. The one photo that exists of one of these tanks in Nationalist service shows that it indeed had the red and yellow flag painted around the turret, but that it did not have the black St. Andrew cross on top, even though a white background had been painted on. Additionally, an engineer unit emblem is painted on the side in the photo, which is not included in this particular illustration. Both of these illustrations were produced by Tank Encyclopedia’s own David Bocquelet. Probably the biggest controversy and mystery surrounding these tanks is the total number produced. The original documents from Departamento de Ferrocarriles de la Naval de Sestao [Naval of Sestao Railway Department], the department within SECN in charge of building the tanks, were lost, a fact that renders an accurate estimation of production almost impossible. The original idea had been to create an initial series of 20 tanks and 2 tractors [see tractor section below]. Commander Casiano Guerrica-Echeverría, Chief of Industrias Movilizadas de Vizcaya [Mobilized Industries of Vizcaya] (a conglomerate of industrial companies from the Vizcaya province), estimated that only about 12 of the tanks were ever actually built. When Bilbao was captured by Nationalist forces on July 21st 1937, the documents of the Republican Army of the North were confiscated. Among them was the organization of the Tank Battalion, which was made up of 2 companies of Renault FT’s, 1 company of gun-equipped armored cars, and 3 companies of Trubia-Navals. Each company consisted of three sections with five tanks in each, 15 tanks per company, 45 tanks in total. The document also stated that the battalion had to be ready in Corrales de Buelna (in the middle of Cantabria, northern Spain) before June 25th 1937. This means that the document was referring to available vehicles rather than a template of intended vehicles. However, Mortera Pérez, is skeptical. He does not think that that many tanks were ever built and believes the numbers on the document are a misprint or were compiled with erroneous information. It is also important to note that in a document of listing captured materiel compiled by the Nationalist General Luis Orgaz Yoldi on September 10th 1937, it states that 20 ‘Trubias’ and Renault FT were available. The exact composition of these 20 tanks is hard to tell. The truth will most likely never be known. Three Trubia-Naval at the grounds of the SECN factory in Sestao with factory workers. Photo: Artemio Mortera Pérez (2007), p. 67. In addition to tanks, the Basque authorities had also shown interest in artillery tractors. The tractor version was an unarmored and unarmed Trubia-Naval but with some modifications. Being a variant of the Trubia-Naval, it also resembled the Landesa tractor. The driver’s position and that of his assistant were turned around and were now facing the engine, as in the Landesa tractor. Most of the driving mechanisms were relocated. In contrast to the Landesa tractor, seats for passengers were added in the rear. This tractor is often referred to as Landesa-Naval, but this is a conventional denomination, and as already explained, Landesa Domenech had joined the Nationalist forces. The full name of this tractor was Tractor Landesa fabricado por la Constructora Naval [Landesa Tractor built by Constructora Naval]. 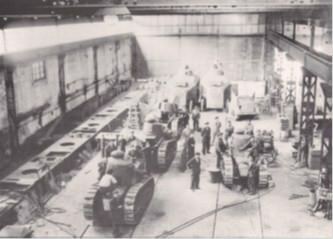 Photo of inside the SECN factory showing 4 Renault FT, two improvised armored cars and a Landesa-Naval at the rear right. Photo: Artemio Mortera Pérez (2007), p. 80. There is not much detail about the operational use of the Trubia-Naval, but there is plenty of information about the campaigns in which it participated. The first Trubia-Navals were probably ready by January-February 1937, and four were most likely sent to Asturias to take part in the last major offensive there in February. Given that there is no further information about these, it can be assumed that they were destroyed. On March 23rd 1937, the Euskadi Light Tank Battalion was formed and included a Trubia-Naval company under the command of Captain Luis Basterretxea de Arendia. The Trubia-Naval were numbers 7, 8, 9, 11, and 13 and were given to their crews for training on March 29th. On April 5th, the Battalion Commander, Captain Carlos Tenorio Cabanillas, compiled a report with complaints about the tank, which included: the low engine power, the insufficient track grip to the ground, the fragility of the clutch, the low height of the mudguards over the ground, and the small and uncomfortable space inside. 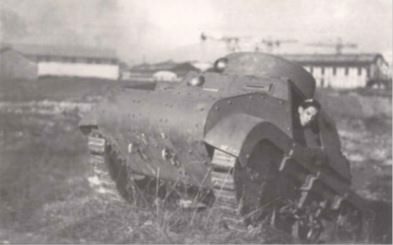 These complaints were noted and the recommendations were adopted for a new improved version of the tank, the Modelo 1937, though exactly how is not known. On that same day (April 5th), the Trubia-Naval would see combat on the Urquiola road destroying a Nationalist ‘tiznao’ (an improvised armored car) and later taking a hill defended by the Condor Legion and capturing a car. On the 7th, No. 12 was lost to the Nationalists in Barazar. On the 27th, due Nationalist advance, the Trubia-Navals retreated to Durango/Yurreta, 26km from Bilbao, where they were reinforced with BA-6 armored cars. In Yurreta, they covered the infantry retreat and BA-6 assault on the Guernica road, before they themselves retreated. 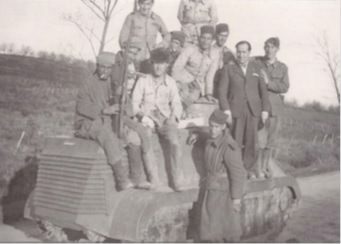 Nationalist troops belonging to 51 Tabor de Tetuán posing atop the captured Trubia-Naval nº12 in Barazar. Photo: Artemio Mortera Pérez (2007), p. 87. Throughout May, the Trubia-Naval were divided up and sent to cover different infantry retreats in the fallback to Bilbao. On June 3rd, several Trubia-Naval with infantry support assaulted Peña Lemona and managed to retake the crag, though this resulted in 5 crewmen being wounded and the unit being taken to Algorta (north of Bilbao) for replenishment. By the 17th, they were back in action again covering a retreat. A day later, the general retreat was ordered and the Trubia-Naval returned to Bilbao to defend the city center whilst the city was being evacuated before the impending Nationalist entry into the city on the 19th. The Trubia-Navals would not be captured though and they retreated towards Santander. Two photos of the same Trubia-Naval with Basque militiamen in Larrauri, north of Bilbao. In the second photo, the militiamen are posing for the camera. Note the box on the rear of the tank. Photo: Artemio Mortera Pérez (2007), p. 91-94. The spoils of war following the Vizcaya Campaign. The photo shows two Somua-Naval armored cars, a Soviet BA-6 and the Trubia-Naval captured by the Nationalist at Barazar on October 7th. Photo: Artemio Mortera Pérez (2007), p. 107. At the beginning of July, all available Trubia-Navals were sent to Laredo, the HQ of the Tank Regiment of the Army of the North. Initially, there were plans to send 11 to Noreña (Asturias) to take part in an offensive, but they were never sent and the offensive did not take place. By August 6th, the Trubia-Naval were incorporated into the Republican Army as the entire Basque region (and consequently the Autonomous Basque State) had fallen. In all, only one Trubia-Naval had been lost since March in the whole of the Vizcaya Campaign. A Trubia-Naval with Republican troops somewhere in Vizcaya. Note how big the side doors were. Photo: Artemio Mortera Pérez (2007), p. 88. Back in June, with Bilbao about to fall, it was planned to move tank production to Trubia. On the 15th, the order was given to build a Trubia-Naval Modelo 1937 in the Trubia arms factory, with a second order on July 4th demanding 9 be built. None of these vehicles had been manufactured by September as the factory was busy enough repairing already existing tanks, including 8 Trubia-Naval on September 25th. On August 10th, the Trubia-Naval were divided into two sections, with one being sent to cover the Reinosa road and the other to Olea, to defend against the southern Nationalist advance on Santander. Not many details are known about the deployment of the Trubia-Naval in the Santander Campaign, but it can be assumed that they were again used to cover the retreat towards Santander. On the 14th, an unspecified number of Trubia-Naval and Renault FT’s were sent to the Escudo mountain pass in support of a section of BA-6’s and FAI’s, allowing for the retreat of the Soviet vehicles. Some would be used two days later in Reinosa. Following the surrender to Italian forces of the C.T.V. (Pacto de Santoña), Santander was taken on the 26th. 4 Trubia-Naval were captured in Santander by the C.T.V. They were divided between the Parque de Artillería de Valladolid [Valladolid Artillery Barracks] and the Fabrica de Artillería de Sevilla [Seville Artillery Factory]. Allegedly, one was kept by the Italians with the intention of sending it to Italy to study it, though it cannot be confirmed if this did indeed happen. However, Spanish figures by the Servicio de Recuperación Nacional [Nationalist Recovery Service] state that only 3 Trubia-Naval were captured, 2 at Muriedas and the other at a warehouse. The spoils of war following the Nationalist capture of Santander on August 26th. The photo shows a Renault FT, a Soviet BA-6, and two Trubia-Naval (one is almost out of shot at the back). These tanks would be sent to factories to be put back into action. Photo: Artemio Mortera Pérez (2007), p. 144. Following the capture of Santander and the collapse of the Republican Army of the North, Nationalist eyes were set on Gijón. The Republican armored forces consisted of a single battalion of Renault FT’s, a Trubia-Naval battalion, and a few armored cars. Due to the terrain and fierce resistance by Republican militiamen, the Nationalist advance was slow. This terrain also meant that tank deployment was limited. On October 20th, a Trubia-Naval was captured alongside a Renault FT in Infiesto, on the Oviedo-Santander railway. Gijón would fall the following day and with it, the War in the North came to an end. What was the exact and common use the Nationalist gave to their captured Trubia-Naval is not fully known, but they generally showed little appreciation of them. By the end of the ‘War in the North’, the Nationalist had plenty of superior tanks and did not need these unreliable and poorly armored machines for tank combat duties. Those which were put back into service were most likely just used to tow artillery pieces or other engineering duties. The one existing photograph of a Trubia-Naval in Nationalist service supports this argument. The vehicle in question (see photo bellow) has a military engineer’s emblem on its side corresponding to the Arma de Ingenieros (Engineers Branch), and would have probably carried or towed the engineer’s equipment. This photo also gives us indications as towards any camouflage or marking scheme modifications on the Nationalist vehicles. As with many captured vehicles, the Nationalist painted a red and yellow Spanish flag around the turret. The top of the turret was painted white, but unlike in other vehicles, a black St Andrew cross was not painted on this white background, though that does not mean it was not painted on other vehicles. 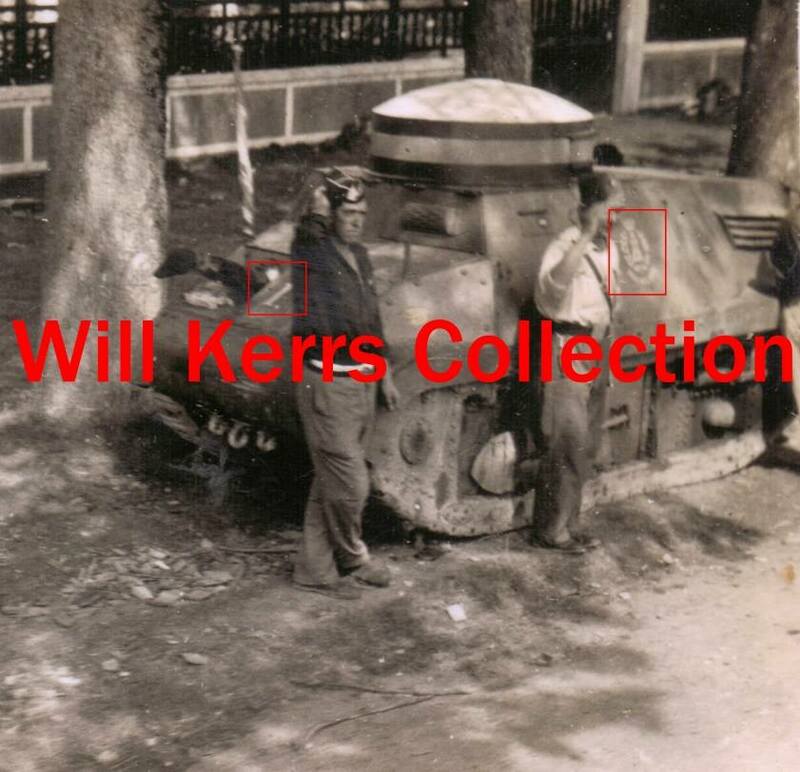 Another curiosity of this particular picture is that on the front of the hull, just next to the machine gun position, is what appears to be a typical early war Nationalist tank markings which could be a ‘1’, an ‘H’ or an ‘I’, but from this photo it is impossible to tell with complete certainty. 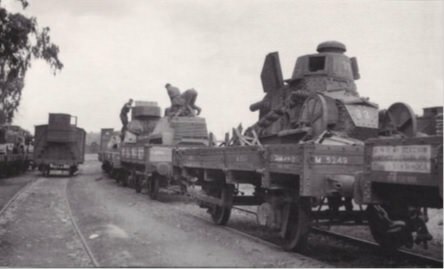 Like many other captured vehicles, the majority were most likely scrapped. Special thanks to Mr. Will Kerrs for allowing the author to use his photo. Were the Lewis guns really “..covered to give the impression they were a larger caliber gun”? Lewis guns not for aerial use normally had a thick jacket over the barrel of light alloy; inside are cooling vanes and air is drawn through it by the muzzle blast of each shot. The flow of cool air kept the barrel from overheating. Guns used on aircraft had the slipstream to cool them and were fired for shorter bursts, so the jacket was omitted to save weight and drag. Yes, that would make perfect sense and should have realized. I will make amendments. Google “lewis Gun” and “Tank: and you will see the same cannon-like appearance on other tanks with Lewis Guns, going back to Mk IV females. In each case it is just the thick cooling jacket. Thanks for the ‘Artillería’ correction, it was a typo on my behalf. Regarding the Basque names, I made the decision to use Spanish names except for official names, such as Lendakari.